Named after the magnificent Aravalli range that surrounds Udaipur, Aravalli is a multi-cuisine restaurant that offers a gourmet experience in equally appetising surroundings. Overlooking the Trident, Udaipur swimming pool, Aravalli restaurant offers a variety of dishes from Western, Asian and Indian cuisines. Our chefs would be very happy to advise dishes to suit your palate and adapt spice levels according to your preference. They particularly recommend you try our classic Indian appetizers and local delicacies such as Laal Maas (spiced spring lamb), Rajasthani Kadi Pakora (vegetable fritters in a thick, chick pea sauce) and their special vegetarian thali, when you stay with us. Aravalli’s dining menu also features crispy Greek salads, Norwegian salmon, Australian pork chops, authentic Italian pastas and risottos, pizzas, stir fried noodles and gourmet burgers, which can be topped off with traditional Indian rasmalai, some rich gulab jamun or a sticky chocolate brownie and ice cream. 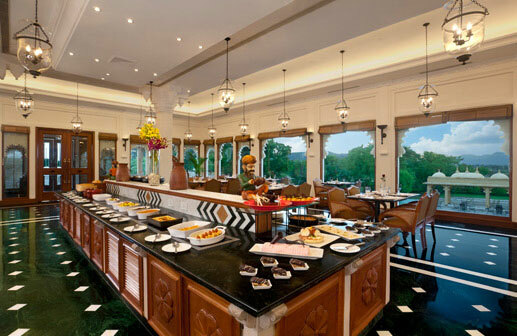 Open from 6am to 11pm, Aravalli restaurant is the perfect setting for an early breakfast, a long leisurely start to your day at Trident, Udaipur, lunch with family, friends or business associates, and dinner at the end of a fulfilling day of sightseeing or work. 06.30 a.m. to 11.00 p.m.